08.25.08 Many of us remember Joel Cartwright as an avid scholastic chess player, veteran of many state championship tournaments and graduate of Bowdoin College. Joel took his own life on June 27, 2008 at his family's cottage in Tennants Harbor. We are profoundly saddened by this tragedy and extend our deepest sympathies to Joel's family and friends. Caitlin Elsaesser of the Times Record prepared this special report including a touching slideshow tribute to Joel. WALDOBORO -- Steve Cartwright was making a blueberry birthday cake for his wife, Kathy, on June 27 when their son, Joel, called to say he'd be late for the party. He said he'd meet the family at their Jefferson camp around 7 p.m.
By 8 p.m. Joel hadn't arrived, and Kathy and Steve were worried. They called Joel's girlfriend, who said Joel told her he was coming early to do laundry. A few minutes later, the girlfriend called back saying she found a letter on six small orange sticky notes in Joel's neat handwriting. All data is from 2001 to 2005 unless otherwise noted. Suicide is the second leading cause of death for Maine youths aged 15 to 24. Four out of five suicide deaths in Maine are males. Females self-injure more often but their fatality rate is not as high. About 63 percent of males older than 10 used a gun when committing suicide between 2000 and 2004. About 56 percent of suicide deaths of people aged 15 to 24 are caused by firearms. From 2000 to 2004, 63 percent of males of all ages older than 10 used a gun. About 32 percent of females age 10 and older used a gun. Source: Cheryl DiCara, coordinator of Maine Youth Suicide Prevention Program, led by the Maine Center for Disease Control through the Department of Health and Human Services. "I tried so hard," the note said. "Tell my parents I'm sorry. I love you, I love you, I love you." That was when Steve, 57, and Kathy, 55, panicked. A month earlier, Joel had swallowed 32 sleeping pills. When Steve and Kathy heard him wandering the house that night, they took him to the hospital, where he stayed for a week. The family celebrated his 24th birthday at the Penobscot Bay Medical Center in Rockport. That was when things started to go really wrong for Joel, whose life until then was defined by large and small accomplishments, ranging from a guitar he built to graduating from Bowdoin College. At an age when many people enjoy the ascent to maturity and success, Joel found himself descending to a dark place from which he would never return. Steve and Kathy didn't know that as they prepared for Kathy's birthday party, but by 8 p.m., they found their worst fears on the verge of coming true. Steve called the police and rattled off a list of places Joel might be. 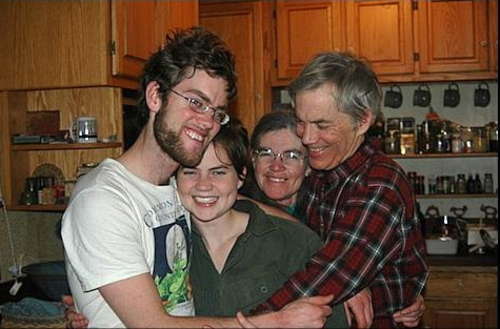 Then the parents and Joel's girlfriend met at the Cartwright home in Waldoboro. Joel's girlfriend remembered the sail they had enjoyed three days prior at Tenants Harbor, at the Cartwrights' summer cottage. It was where Joel had inherited his love of sailing from his grandmother. Suddenly, they knew where the police would find Joel. Chelsea Cartwright, 22, sits on the sunny back porch of the family farmhouse and flips through a collection she calls the "Joel Book." Made of brightly colored construction paper, photos and scrawled phrases, the pages chronicle her big brother's life. Chelsea gave the booklet to her parents for Christmas in 2002, the year Joel graduated high school. Lots of photos adorn the paper: One of young Joel and Chelsea playing with suds in the bathtub. Another of him holding a hatching egg, his blue eyes full of awe. Another of him riding a tricycle on the family porch, snow falling around a young apple tree sprouting in the background. In one photo, a tiny Joel and Chelsea embrace, sitting on a stone wall. The photo was not posed, said Steve; the siblings had an unusually close relationship. Chelsea was born on the living room couch while Joel fed their mother frozen blueberries. That couch, over the years became an important place in their relationship. There, the two bundled in towels after bathing as toddlers, did homework together and listened to their father's beloved bedtime stories. Conflict between them was rare, said Chelsea, her green eyes standing out brightly from her delicate, freckled skin. She remembers only three times she and Joel quarreled, and how they shared a love of reading -- Calvin and Hobbes comic books were a favorite-- and creativity. The siblings were bound by an unusual emotional intensity. As she grew, Chelsea dealt with her intense feelings through mind-body studies and workshops in arts meditation. She became a trained massage therapist. Joel struggled more than she did. Chelsea describes her brother as "bookish" and gentle most of the time, remembering how he won chess tournaments through junior high. But Joel had another side. He would sometimes rip up his teddy bears or coloring books for no apparent reason. In high school, he broke his hand punching a wall. "His rage, when it came out, was a lot, and would scare me," said Chelsea. "I would get confused, because I knew later he would be sad he did it." Joel's parents noticed his extreme sensitivity, too. "I could say one little thing and it would just crush him," said Steve. "He didn't have the normal body armor most people have." When Joel attended Bowdoin College, his family watched him blossom. His college friends said he was the hub of a social network he created, frequently hosting potlucks and music jam sessions. He held fundraisers for various causes and excelled academically. He won Bowdoin College's community service award, partly for helping develop a program to compost food waste for the Bowdoin College dining hall. He started the Bowdoin College Organic Garden at Crystal Spring Farm, a project that last season produced $16,000 in vegetables for Bowdoin's dining hall. "I talked about Joel all the time to my friends," she said. True to their relationship, Joel asked Chelsea to help create a T-shirt to advertise the garden. As Chelsea described Joel's accomplishments recently, she held that T-shirt, tracing the design of a dragon made of a bounty of vegetables. In the Joel Book, there is a picture of a 3-year-old Joel doing one of his favorite things: shoving his father off a dock. "I would say, 'Nobody but nobody would push me off this dock!'" Steve recalled. Splash. Joel loved this game. Steve and Joel, both wiry and slim, shared a love of exercise. In the barn are stored dozens of road race numbers from all the races they ran together. Both harbored a passion for sailing and every year they enjoyed a canoe trip to northern Maine. The summer after he graduated from Bowdoin College with a degree in anthropology and environmental studies, Joel broke his ankle. A sailing trip he'd planned to Puerto Rico was canceled and Joel moved home for an eight-month recovery. What seemed like a temporary solution turned into living with his parents for two years. The inactivity frustrated him deeply. Though he struggled to find direction, he kept busy. Every day, he made long lists, each neatly dated at the top, of what he intended to accomplish. "He seemed to do more and more as time went on," said Steve. Joel built a solar hot-water heater for the house, organized his grandfather's tool shed and started several wood-working projects including a guitar, a rowboat and a small model bird. He revived and expanded the family's garden and started drying beans. He helped his parents convert their cars to run on vegetable oil. Despite these accomplishments, Joel's journals revealed how frustrated he could become. "Another up-and-down day," he wrote in an entry on Sept. 14, 2006. "I got a good start making bread, but then the bread didn't get cooked all the way through and somehow my good mental state went down the tubes." Chelsea said Joel often was not satisfied with his work, a conflict she saw represented in a charcoal sketch from high school, which he titled "Running from the Shadows." In it, a wooden figure flees dark figures surrounding its feet. He once told Chelsea his activities masked his true state of mind. "I feel like I have done these things more out of frustration than love," he said. Steve sensed Joel's frustrations. He, too, had experienced periods of sadness in his life but was never able to share these with his family. Instead, Steve focused on being upbeat and staying busy. Reflecting on his son recently, Steve slowly eats a bowl of applesauce Joel had made, topped with maple syrup they made together, looking to the apple tree in the backyard that once overlooked Joel's first try on a tricycle. The tree is heavy with age and apples now. "I spent a lot of time propping Joel up," said Steve. "Like the prop against our heavy apple tree." -- Talking or writing about death, dying or suicide, when these actions are out of the ordinary. Joel inherited a love of gardening from his mother. Early pictures show him strapped to Kathy's back as she yanked weeds, his full brown hair peeking out. This past spring, though the garden thrived, Kathy's focus was on her son, whose behavior worried her. After Joel visited Chelsea on the West Coast in early March, he told Kathy he had had a wonderful time. But then he quit his job at YouthLinks, a youth support program in Rockland, after working there for only two days. The organization let him try to re-start work, but he somehow could not commit to it, which devastated him. Kathy knew this was a bad sign. Joel started to speak openly about his depression. He complained of not feeling well and refused to do physical therapy for his injured foot. He struggled on his numerous projects, unable to finish them. "I knew he was depressed," she said, but she attributed his low mood to having the flu. By Monday, May 19, Joel was suicidal, said Kathy. He went to Maiden's Cliff in Camden one day and stayed there for hours, he told his parents. Though he promised Chelsea he would never have jumped, that night he asked his mother to kill him. "I felt helpless," she said. The trouble signs began piling up. After a first session with a local psychologist, Joel told Steve he had gone to look at guns. He'd broken down on the way home, screaming in the car. Steve asked Joel if he was OK.
"I'm already dead," said Joel, prompting his father to call 911, which brought Waldoboro police to the house. They spoke to Joel about the seriousness of his actions, but let him stay at home. On May 20, Steve and Kathy learned Joel had purchased a six-pack of beer and sleeping pills. This time, the Waldoboro police took Joel to Miles Memorial Hospital in Damariscotta. They kept Joel for more than nine hours and a Sweetser therapist talked with him at length, but the doctors did not commit him, said Kathy. Joel's doctor and friend, Ted Mohlie, put him on Celexa, an antidepressant, and told the family to keep Joel on a 24-hour watch. Kathy and Steve tried to be constantly aware of Joel's activity during the next few weeks. They stayed awake until they heard him go to bed and tried to ensure he was never alone. Kathy and Joel spent Wednesday, May 28, together. They ate lunch at the Rock City Books and Café in Rockland, and to his mother, Joel seemed happy. She offered to buy Joel a handful of books he had picked out. He said he could just take them out at the library. When Kathy left Joel for 30 minutes to run an errand, he had bought a new bottle of sleeping pills. He took the entire bottle that night. When Kathy and Steve went to bed that night, Joel seemed asleep. But after hearing him playing the guitar and talking to himself, Steve woke to investigate. He quickly realized something was wrong. When Joel spoke, he didn't make sense. He wanted to go out in the garden. At 7 a.m. the concerned parents called a doctor, who told them Joel might be reacting to medication. By mid-morning, it was clear that was not the case. Steve scheduled an appointment at a hospital. Kathy knew Joel would hate it. When they took him to Penobscot Bay Medical Center, Joel seemed ready to run away. The doctors called three security guards, but Joel ended up in a fetal position, banging his head against the floor. Kathy stopped him. The first night, Joel broke a window with a chair and wrote "I want to die" on the chalkboard above his bed. "The only benefit of his being there is that he couldn't kill himself," said Kathy. On Joel's 24th birthday, May 30, friends crowded the hospital room with fiddles, guitars and banjos. One friend performed an Irish step dance. Hospital staff said they had not seen so many people visit one person in years. But Joel's greatest comfort was seeing Chelsea, who had already planned to come to Maine for his birthday. At the hospital, she held her brother's hand and asked him to repeat a mantra: "Chelsea loves me just the way I am." He did, but when she asked him to say "I love myself just the way I am," Joel was silent. The hospital could hold Joel for only eight days, which Kathy believes was related to insurance coverage. On Joel's final day in the hospital, the family gathered with him to devise a plan for his discharge. Joel would spend time at the Bowdoin College organic garden, now managed by his friend, Katherine Creswell. He would go to the library to think about job possibilities that combined his love of gardening and working with young people. He would attend therapy. Joel talked about making a change. The family was uneasy but had no other option. Kathy tried to admit him to Gould Farm, a residential therapy program based in Massachusetts that she and Chelsea thought embodied many of Joel's values. She put him on a waiting list, but the first opening was in August. Other programs also had waiting lists. The Cartwrights decided it would be good for Joel to rely more on a support network outside of the family. Kathy was not entirely comfortable with giving Joel more freedom. "They wanted me to let go," Kathy said, "but all I could think about was that he would not be supervised." Joel showed slight, if any improvement. He started therapy and said he liked his counselor. He told his friend Katherine he was going to try to learn one new song a week on the guitar. He bought caulking and paint to fix up an old rowboat a friend had given him for his birthday. He lived with Katherine for a few days in Brunswick so he could garden more. Concerns lingered. The hospital doubled his antidepressants -- now Lexapro -- without telling Joel. He complained of dizziness and fatigue, both known side effects of the medication. Katherine said that while he stayed with her, he sometimes couldn't wake up in the morning after he'd told her he wanted to garden. She would check on him at lunch and find him still sleeping. Joel felt guilty about the stress he was causing his parents. Kathy lost weight and Joel was frustrated when Steve canceled his annual canoe trip to be with Joel. The night Chelsea left, she and Joel shared dinner and laughs at the Sweet Leaves Teahouse in Brunswick. Chelsea was divided about leaving. Staying at home was exhausting, but she feared for Joel's safety if she left. He had told her in the hospital that as long as she was with him, he couldn't commit suicide. He had also recently told her that he could find no forgiveness for himself, that the world looked desolate to him. He was sick of talking because he felt it didn't do any good. Joel dropped Chelsea off at the bus station, but her bus took a while to leave. She pressed her face against the window, making hearts with her hands and mouthing "I love you." Chelsea remembers thinking Joel looked like a little boy, small and vulnerable with his wistful smile. She waited until the bus pulled away to let herself cry. On Friday, June 27, Joel drove to Johnson's Sporting Goods in Rockland. He had a lot of questions for the sales clerk who sold him a .22-caliber Ruger Mark III pistol. Joel paid $307.39 for the pistol and small box of bullets. Individuals who have been "blue papered" -- a term referring to a person who has been involuntarily committed to a mental hospital, as Joel was -- are prohibited by federal law from purchasing guns, but nothing stopped Joel that day. His background check cleared because Maine does not report this type of information to the federal background check database. Joel filled out his firearms transaction record in neat, careful handwriting. Height, 5 feet, 9 inches. Weight 150 pounds. For a question about whether the buyer had been committed to a mental institution, Joel wrote "No." He drove 20 minutes to his family's cottage at Tenants Harbor. He called Steve, who later said Joel sounded shaky, to let him know he'd be late for his mother's birthday party. It was a warm day, and the sun likely sparkled on the ocean as Joel sat leaning against the boathouse. At some point between 10 a.m. and 1 p.m., according to police, Joel shot himself in the heart. In his pocket was the name of a new therapist. In California, Chelsea had been meditating ever since she heard her brother was missing. She had a vision that she held her parents hands, encircling Joel in the center. As they let friends and family into the circle, Joel hovered in the center, strings dangling from his body but no longer attached to anything. They promised Joel with one voice that they would be his roots here on earth. The strings disappeared and he floated away. At home, Kathy crumpled and could not move. State police troopers carried her to the sofa. Steve drove to the cabin and crossed the police barricade despite their protests. A trooper later told Steve he would have done the same thing. Steve found his son's black Volkswagen Jetta in the driveway with the gun case in the front seat. When he found Joel leaning against the boathouse, he first kneeled, then lay in the grass beside him. The police told Steve not to touch the body, but Steve hardly heard them. Joel was dead. -- Sept. 7, Sweet Leaves Teahouse at 22 Pleasant St. in Brunswick, 3 p.m. to 7 p.m.
-- Sept. 12, Unitarian Universalist Church, 45 Broadway in Rockland, 7 p.m.
Also on Sept. 7, Back Cove in Portland will be the site for the Southern Maine "Out of the Darkness" community walk, the 5K fundraising and awareness walk that will benefit the Maine chapter of the American Foundation for Suicide Prevention. Check-in begins at 9 a.m. on Preble Street, across from Hannaford's. A short program and raffle will kick off the event. Four other similar walks are upcoming in Maine: in Bangor on Sept. 28; Camden on Oct. 11; Presque Isle on Sept. 20 and Waterville on Oct. 18. Register at the Web site www.outofthedarkness.org. Steve and Chelsea have adopted a morning ritual. When the mail arrives at 11 a.m., Steve opens and reads condolence cards, passing the best ones to his daughter. At first, they received stacks of cards each day. Now, a month and a half after Joel's death, they receive about three a day. Around the house are Joel's unfinished projects, yet to be resolved like the Cartwrights' so many unanswered questions. Steve plans on finishing Joel's rowboat, but the family is unsure what they will do with his other projects. Each member of the family deals with Joel's absence in different ways. None of them avoid the difficult questions. "We all have our guilt stories," said Chelsea. On July 25, Steve and Chelsea took Joel's pistol back to Johnson's Sporting Goods for a refund to put into a memorial fund. He spoke with the clerk who had sold Joel the pistol. "I need to make a return," Steve told him. "This is a really sad story. My son used this gun to kill himself." Chelsea stared quietly, wide-eyed at the guns and bows lining the store's walls. The clerk and the store owner seemed uncomfortable, and as Steve filled out the paperwork for the return he tried to put them at ease, asking about their bow-hunting hobby. But when Steve voiced his concern over the laws regulating Joel's gun purchase, the clerk curtly explained that Joel would probably have killed himself another way had he not bought the gun that day. "I think he could have made it," he said. "Who knows?" The family spends a lot of time thinking about the paths that could have led to a different outcome. "In the last few weeks this is running in my head over and over again," Steve said. "What could we have done differently?" Steve worries he didn't allow his son to express sadness enough. Kathy wishes she hadn't left him alone during those final days. Chelsea questions her choice to leave Maine. They all wish Maine enforced the federal gun law and that there had been better medical services, a place more appropriate for an active young man, one that would have kept him longer. No one blames one factor in the suicide, but they believe Joel's death was avoidable. Chelsea has thrown herself into continuing what Joel started. "It is inevitable my focus is going to be on Joel. I have a choice," she said. She pauses, apparently lost in thought. "Can I look at the shadows with a light rather than just fading into them? Can I use what Joel has taught me to do some good?" Chelsea has organized events to raise money for the Flannel Shirt Fund, as well as a retreat to celebrate her brother's life. Kathy is determined to develop more resources for the mentally ill. Steve, a journalist, is investigating Maine's gun laws. But in the moments when all the activity stops and there are no visitors, there is only a painful hole in the family where Joel used to be. "He was really the hub we acted on," said Kathy, voice cracking. "His encouragement made us try new things. Now he is not going to be around." Chelsea sorted through Joel's desk recently while listening to Gordon Bok, one of the family's favorite folk singers. She sang along to "Going On," the song Bok performed at Joel's memorial, a song that has brought the family comfort in recent weeks. As she sang the refrain, her voice faltered and tears dripped down her cheeks. Steve moved across Joel's bedroom to her, put his arm around his daughter and continued the words in his own scratchy voice. "It still goes on, it will go on/ in the sharing of a smile, in the caring for a child/ asleep in your arms and dreaming/ it still goes on." They held each other and let their tears fall. So sorry for your loss. I know a young woman who is suicidal. It is such a devastation. The family doesn’t know what will happen from one day to the next. I wish you peace in the years ahead as you continue to process the loss of your beloved Joel. I'm so sorry to read about the loss of your beautiful son. What a lucky boy he was to have such a loving family. I'm sending this page to my mother, in England, who remembers Steve as a boy. I have many wonderful memories of Joel - playing intramural soccer, sharing meals at Moulton and Thorne, celebrating graduation together... the happiest memory, however, is of a hanging out with Joel during a terrific concert by the Acadian folk group, Grand Dérangement in the spring of 2006. His excitement for the music was infectious. Joel, you are missed so very much. I was only informed of Joel's death tonight; I still don't understand why the devastating news took so long to reach me. I am naturally feeling shock and sadness and though I will never know how you feel and the pain you went through and are still feeling, I just wanted to let you know that I've always held Joel in very high esteem as a fellow student and coworker. I worked in the music library with him at Bowdoin 2005-6, and he was always cheery, with a beautiful smile to welcome me as I took over for him at the desk. He was considerably quiet, but I could tell he was talented, winsome, and humble. I will always have a wonderful recollection of him, as the gifted, kind, musical person I knew. This world has lost a great person, but his spirit lives. I remember Joel fondly, we went to school together. I wasn't close to him, but he always greeted me with a smile and he always was so gentle and friendly. You will always be in my thoughts and prayers for it is too often we lose our loved ones too early to depression. Dan....So much could be said here. What you have included is testimony both to your sensitivity and balance and to difficulties in suicide prevention. And, of course, "But for the grace of God or our higher power go we." My sympathies to his family and friends.